It's for Amazon Europe for now but I guess this is coming to the US sooner or later. Indirect purchase fees are going down to 1.5% for a lot of big categories. It's hard to work out whether this is good or bad news. After a quick glance, it looks like most of the categories are increasing in commission for direct purchases. They are also bringing back tiered payout structures for higher earners. 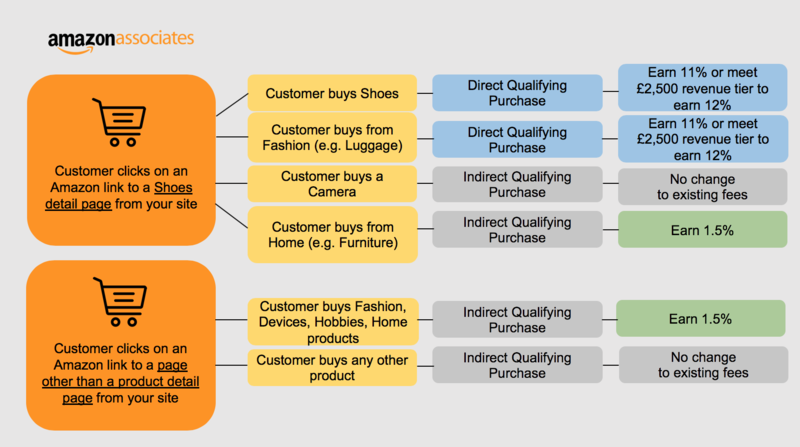 Although, most of the higher earning affiliates will also make a lot of money from the indirect purchases, which is part of the reason Amazon Associates is so appealing. This drop to 1.5% could result in lower earnings, despite the higher commissions. I have a site that sells handbags. My best handbag page links directly to the product pages I am promoting. Someone buys a handbag, and I get 11%. That same customer also buys lots of things to put in the handbag. Make-up, a scarf, torch, mirror. All of these items will only net me 1.5%. I think this will be the biggest change because I don't see many people linking to the Amazon homepage or category pages. I hope this isn't a test like "roll it out to a first world program that's not the US to test it." I've got 3-4 other programs for my niche that will pay a higher percentage than the one listed for my niche on that page you linked (that decreased). I'll either add extra buttons linking to these other programs while still including Amazon, or link to the others and not include Amazon. The benefit being that the others don't change their programs. They've been the same forever, while with Amazon they change frequently and there's always the fear that they'll no longer want affiliates. They certainly don't need us. I'm wondering if there's some legal precedent that's making them make this change across the pond that's irrelevant to the US. Luckily for me, I don't bother geo-targetting to the EU any more, so none of my Amazon earnings come from there any longer. Be interesting to see if it rolls out across the pond too. Are most people's commissions related to the products you promote or are most Amazon affiliates making most of their money from unrelated purchases? For me, most of my commissions come from products that I promote. The good thing about Amazon however, is that everyone uses it to buy stuff. Say someone has 10 items in their basket and clicks a link on your site and adds something else. If they then check out, you will receive the commission on all of the items. Once these changes come into effect, all of these extra items will now get you 1.5% commission. If they then check out, you will receive the commission on all of the items. That is the thing that always bothered me about Amazon and the affiliate world - in that scenario you did nothing to get those products in the shopping cart. You added no value to Amazon or the product sellers. Why should you get a commission off of Amazon’s brand and work? If I think in those terms, for awhile now, there has to be others within Amazon that are thinking the same way. But at the same time, Amazon might simple be smarter and realize it makes sense to have millions of websites pushing it’s brand versus potentially competitors, therefore creating an artificial monopoly. Consumers will think “Since millions of websites link to Amazon it must be trusted” - they have zero clue about affiliate marketing (99% of consumers do not) or that those websites are making money when you purchase products through their links. Amazon keeps it’s monopoly AND it forced product creators to have an Amazon presence otherwise lose sales to competitors since Amazon is so convenient. But the moment Amazon slips and becomes a bad experience for customers - the house of cards fall quickly for everyone. So with those two extremes in play, they can use an A.I. down the road to see where the perfect balance is of low commission and placating site owners is. But still something just doesn’t feel right in my gut about this scenario. Bezos needs to make more money now he is getting divorced! But yes, I can see that people have had an easy ride with Amazon over the years despite the 24 hour cookie. The benefits of getting earning from the additional items is (was) one of the good points about their program. But at the same time, Amazon might simple be smarter and realize it makes sense to have millions of websites pushing it’s brand versus potentially competitors, therefore creating an artificial monopoly. Maybe it's just the traffic leak to end all traffic leaks? Google could remove them tomorrow and they'd still be one of the most visited websites on the internet. I think that Amazon Affiliate has been dying for a while. I feel like it's a supply/demand issue where the incentive for Amazon to reward affiliates has decreased substantially. These big corporations don't do things out of the goodness of their hearts. There is an intense amount of competition from a few big players, these sites probably generate the majority of the income for amazon via affiliate. Then we have an extensive amount of competition who are gradually being squeezed out more and more by the "intense" competitors who will fight you to the death for every keyword. I said years ago that flipping sites as a business model is shortsighted and that all you're doing is feeding the competitors who will make you rich today but poor in 10 years time. A lot of people have been gamed and fooled by multiple people and seduced by the idea of fat profits for little work. Bottom line is it (amazon affiliate) is such a low-barrier to entry that the number of people that are doing it have created the situation in which Amazon can change the rules like this and still win. It was probably their plan all along. You don't become one of the biggest companies in the world for nothing. I think the biggest impact from this change will be seen at Christmas. Those big Christmas Amazon paydays come from commissions of indirect purchases. You know, when someone jumps on Amazon to buy a £1 baking try and then spends £1,000 in Christmas gifts while they're there. Before, you'd be looking at around 7% commission (depending on the category) on that £1,000 in indirect sales, but this Christmas you'll get 1.5%. I would assume with this change that Amazon will see a massive increase in profits for themselves over Christmas. March 1st 2017 Amazon changed their commission fee which hurt a lot of affiliate. Again, March 1st 2019 we see another cut. I hope this trend doesn't continue, but with Amazon being a business and always looking to grow, shaving affiliate commissions seems like an easy way for them to increase their bottom line. It looks to me that Amazon are being quite strict when it comes to giving commissions on products that are not being promoted, even if they are in the same category. I've had multiple instances of a customer buying a product that is closely related to the product I am promoting, and only receiving 1.5%. In some of these cases, the product is virtually the same, just with a slight variation or different model number. To give an example, say my site covers the Apple iPhone 8 extensively, and someone clicks a link and buys the iPhone 8 Plus, I've only been getting 1.5% on these. In the Amazon graphic further up this thread the commission on products in the same categories shouldn't change. If your sales page (that you spent time and money creating) is converting traffic into sales of a specific product, then you should be properly compensated for those sales. The thing is, you've sold that person on buying, all they are then doing on Amazon is "fine-tuning" their purchase by selecting their preferred colour / size / model / accessories, etc.